High speed rail (HSR) encompasses a complex reality involving many technical aspects, such as infrastructure, rolling stock and operations, as well as strategic and cross-sector issues including human, financial, commercial and managerial factors. High speed has proven to be a very flexible and attractive system that can be developed under various circumstances and in different contexts and cultures. This is the result of four main and very important characteristics offered to customers and society: safety, velocity, capacity and sustainability. As a result, HSR is a rapidly expanding new transport mode, often described as the "transport mode of the future". This brochure aims to communicate and disseminate high speed characteristics, performances, improvements, innovations and potential applications. 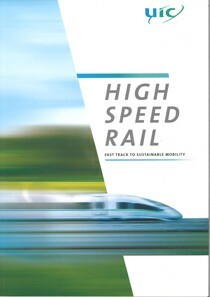 This brochure is published regularly (approximately every two years) on the occasion of the World Congress on High Speed by UIC, with contributions from its national high speed members which are received with thanks.